Is it just me, or do people seem to either love or hate minivans? I’ve never been rabidly anti-minivan, but I’ve never longed for one, either. I just really love our station wagon, tape player and all. But the time was drawing near. Our station wagon only seats three children, meaning we’re maxed out. Having the option to drive the kids’ friends along with us sometimes is important to us. And weaving the baby car seat over a booster seat is not exactly easy. However, we didn’t see these limitations as reason to rush out and buy a minivan the moment we had a positive pregnancy test, or a live infant for that matter. An inconvenient car seat situation hardly constitutes an emergency. Neil started researching and looking at ads for minivans during his baby-batical, in part because he had more time for this type of thing than usual. We concluded that, while we didn’t need a larger vehicle right away, we’d like to get one within the year, when it would become even more inconvenient to fish the baby in and out of the car. Also, that would mean we’d be able to take the kids’ friends places by next summer. The options for third row seating these days are: giant, expensive SUV; full-size van; or minivan. Not surprisingly, pricey SUV was never on the table for us. And despite having learned to drive on a Club Wagon, I’m afraid of how many mailboxes I’d hit in a full-size van, not to mention the abysmal gas mileage. Minivan it is. For more on PTBP car-buying philosophy, check out Point A to Point B and Free and Broken. What about reliability? We do spend more on the family vehicle (which goes on my car spending tally, which was not much more than Neil’s). Our budget for the van was somewhere around $6000. Of course we’d already saved for our next car in our Car Fund. I highly recommend that, rather than paying interest on a monthly car payment, everyone set aside money in a Car Fund until you have enough to buy your next vehicle outright. Rinse and repeat and you’ll never need a car payment. Neil approached the van purchase with his usual analytical research. He bought a month of online Consumer Reports and read their reviews. He read online about common problems with the different brands. He test drove a Toyota and a Kia for a side-by-side comparison. The Toyota Sienna was the clear winner on all fronts so he narrowed his search to those. And although he didn’t put much weight on anecdotes, all my Sienna-driving mom friends sang its praises. Neil’s ideal scenario for buying a van was to skiplag somewhere south on a weekend, buy a rust-free van, and drive it back. Our station wagon was purchased from a small private dealer who sells cars from the south, and Neil has always dreamed of doing this himself rather than paying someone else to. Big surprise, right? But he found that the private sellers he was contacting weren’t getting back to him, and who wants to fly somewhere only to have a seller flake out? Our weekends can also be pretty packed, making it too much to pull off right now. He started searching Facebook and Craigslist, but in the end he got this car the same way he bought two other cars: through work connections. He works, as most do, with people who upgrade their cars fairly frequently. So he put the word out that he was looking for a minivan and would pay trade-in value or higher. Soon enough, someone was looking to trade in their 2006 Toyota Sienna with 130,000 miles. Perfect! While many people are scared of cars with that kind of mileage, we think that’s around the sweet spot for buying a car–depreciation rapidly drops off around this point and some major scheduled maintenance has already been done. Only in this case, the timing belt needed to be done. It was 40,000 miles past due! We were prepared to pay someone to do the job. But after Neil watched some YouTube videos, read about the job for that year and model, and consulted a mechanic friend, he decided to do the work himself. We purchased the van at trade in value for $3500. Typically a similar van would be listed privately around $6000. He spent around $500 on parts since he also ended up replacing the radiator. He estimates the work would have cost $1800 at a mechanic. A timing belt job is not for the faint of heart; there were some hairy moments, but overall he seemed to enjoy the challenge. Even if we’d paid someone to fix the van it would still be a fair value. We were prepared to spend that much. But with Neil taking the leap to do a tricky major repair himself, we’ve got ourselves a decent deal. We’ll see how it does for us. But it runs smoothly and is by far the most luxurious vehicle we’ve ever owned. Don’t rush out and buy the car you need a year–or two or three–from now. Be patient. Save for your next vehicle in a designated account that you don’t touch otherwise. Buy used, preferably past the 100,000 miles to minimize depreciation. Do your research. Check out consumer reports and other online reviews. Put out the word that you’ll pay trade-in value or more when people you are know are upgrading. What’s your approach to buying cars? Have you ever done a major job on a car? We are in a similar boat. It turns out as a TSX isn’t a family car. Who would have thought? (Me, me, me! But who didn’t listen is another story. WINK!) I’m so glad you wrote this! Glad this is good timing for you! I think it makes sense to try making what you have work first. And not buy the car you think you might need in a couple years, unless you are very set on a large family or something like that. Every family’s preferences are different. We were able to limp along the 2-door car until baby #1 turned 1. Then we got the wagon, but booster seat laws have changed since then so I’m not sure the backward seat is safe/legal. And we had no idea then whether we’d have more than 2 kids. Anyway, good luck finding the right family-friendly car for you! Congrats. Hopefully you and your family get some great usage out of it for many years. Thanks, we hope so too! Congrats! Looks like a cool vehicle. Unlike some I suppose I’ve dreamed of owning a mini van someday. I’ve only ever had these tiny cars with little to no monthly payment, and the idea of getting a big boy and maybe even something it can tow like a pop up camper gets me all excited. But I have to remind myself that the excitement of these big purchases falls off fast. Financial freedom is so much more fulfilling than financial slavery. I love this post because of how hard it scratches my confirmation bias sweet spot. Car payments? No way. A couple years ago, we bought a used Yaris from Craigslist for $3000 from a couple who was moving to San Francisco and didn’t want to pay $500/month for an extra parking spot. We literally gave them the cash about 12 hours before they left town, thanks to my husband’s dope negotiating skills. Every time we tell this story, we get a lot of “yeah, buts…” that typically amount to all the excuses why this is a unique circumstance that they could never recreate because reasons. YES, this deal will never come along again and it is more inconvenient than tootling to a car dealership and financing. However, there is always a good deal to be found if you are willing to trade about 20 hours of hassle for literally thousands of dollars of savings. I’m not about to tell people what they should do with their money, but I feel like the real reason people have a car payment much of the time is that it is inconvenient to do the private used car market. I would also like to note that my husband and I know f-all about how to fix cars. Our mechanic charges $25 to inspect a car. He’s a precious jewel who can never ever retire. Great point that even though a particular deal can’t necessarily be reproduced, if you’re patient there will be more deals. At this point I think we are getting deals in part because Neil has a reputation at work for taking on cars people don’t want to deal with. He’s picked up vehicles from coworker’s neighbors or fellow colleagues (that Neil doesn’t know directly). Shopping at a dealership and doing all the paperwork for financing is also time-consuming, I’d add. We bought our minivan back in April when Rob started his new job and could no longer commute via bike, and it’s the best car I’ve ever owned. We paid $5700 upfront, but it needed $1300 in immediate repairs which we did not do ourselves. We were down to the Honda Odyssey or the Sienna, and ended up with an Odyssey. As an interesting wrinkle in the buying process- most dealerships cannot finance a vehicle that is more than 10 years old or with more than 140,000 miles. That leads to a nice dip in price. Ours was a 2008, but with 143,000 miles. We talked about buying a minivan years ago when we first started renovating our house, but decided against it to remain a one car family. Still, from now on, I think I’m always going to drive a minivan. Glad you are enjoying your minivan. I don’t know a parent who owns one and doesn’t love it! 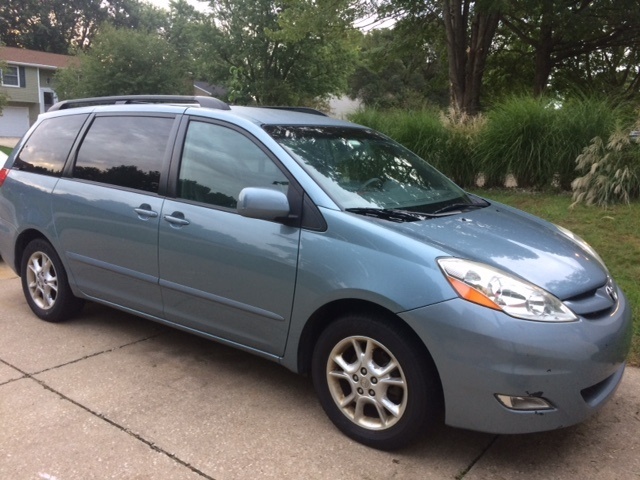 Our 2006 sienna has 250k miles and still going strong. We’ve had no issues. Only routine maintenance. We no longer need a mini van, so we may turn it into a camper. I agree that around 100k miles is a sweet spot for a week made vehicle. You save so much. Glad to hear your Sienna has done so well for you. Camper conversion sounds fun! I have been using minivans as work trucks for more than 20 years. Back then they were plentiful and dirt cheap on the used market. Since then SUVs have become the dominant family car and used minivans are harder to find and more expensive. I have owned Chrysler, Honda, Mazda, Mitsubishi and GM minivans and my girlfriend has been a Toyota Sienna owner for 10 years. Chryslers work best for my purposes although I think Honda and Toyota are equally good quality. I think you will be quite happy with your Sienna. Minivans are the most versatile vehicles in the history of transportation. Glad to hear the minivans have served you well. We especially wanted to avoid the Dodge Caravan as the older ones in our region seem to have rust problems. Which is a huge pain if you fix your own car. Everything on the road ends up with rust around here. The ice melting chemicals the state uses causes most cars to be junk at about 15 years old, well before the drivetrain is worn out. That’s great you got so much life out of your van, even if it was unfashionable! During college, Neil restored a totaled station wagon he was given. Doesn’t get less cool than driving a grocery-getter as a college guy! Thanks, I hope we enjoy many years of family activities in this vehicle. We do plan to continue renting a vehicle for our longest road trips as part of our strategy to keep our old cars running longer. That’s a good buy. I always buy used cars with between 100000 and 160000 miles. I never tackled a timing belt job good for him for doing that. Lots of life left in that can. Also our library gives us free online access to consumer reports. The only bad thing about your purchase is from 2007 on Toyota siennas switched to a chain not a belt. I looked for that when I bought my 2009 vibe because I know it’s a pain to change that. Do any of your neighbours come around to see why your working on your car? I have this annoying old guy always come around to try and give me advice. His advice is so dated it’s almost always wrong but I politely listen to him anyway.